Everyone loves a good yarn about cycling in Ohio, and Columbus Dispatch writer Steve Wartenberg is tackling THE Ohio bike story. Follow along here. I will be riding the entire Ohio to Erie Trail, all 330 or so miles, for the first time. And, I’ll be riding with the experts: members of the nonprofit group responsible for building up the trail to what it is today (mostly paved). They’re still working with local municipalities to pave the few remaining unpaved miles, and – as you may have noticed - there’s a lot of working going on right here in central Ohio to reach this goal. Wartenberg and his fluctuating group pushed off from MIllersburg this morning, making their way north to the Towpath Trail in Cleveland. 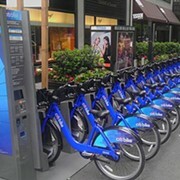 Would a Bike-Share Program Thrive in Cleveland?